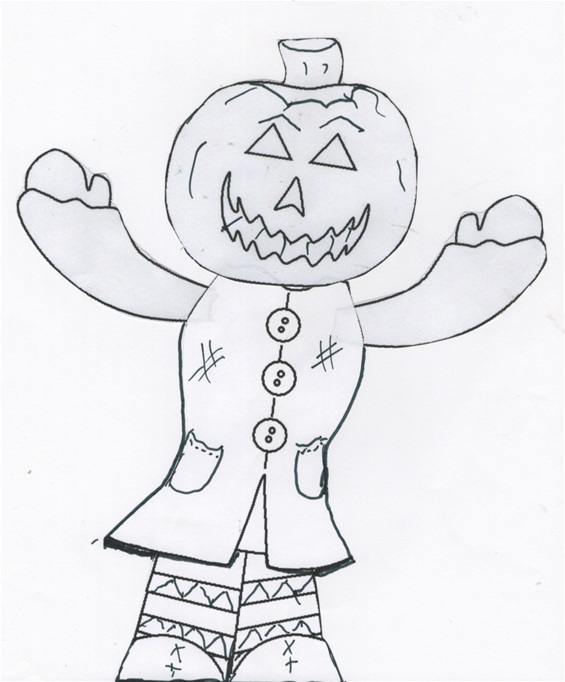 Our first Fall/October Activity, MERLE SQUIRREL AND THE SCARECROW can be found at M. C. Arvanitis's blog -- click on above link. 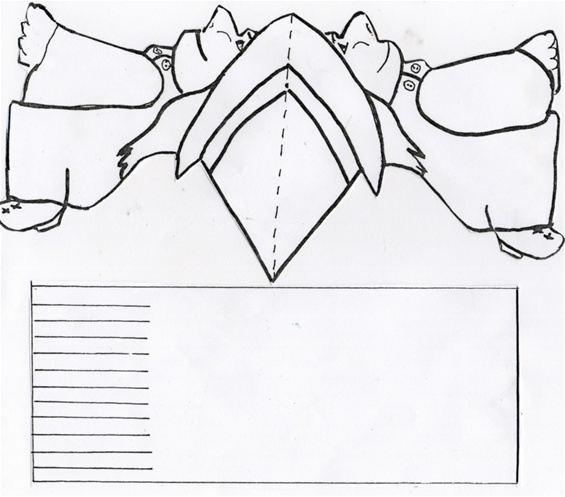 © 1988 M.C. Arvanitis This story is free to copy off and use in your classroom but is copyrited to M. C. Arvanitis so it can not be shared elsewhere in print or electrontically. Our Favorite Book of the month. Halloween coming up .. Want a sweet (non scary) book for your students? I am always looking for "read to children" books with wonderful illustrations to share with teachers. 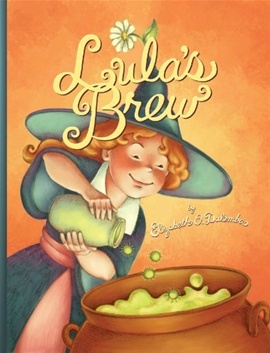 Lula’s Brew by Elizabeth O. Dulemba has both so I have featured it for this year's October curriculum. Or Paperback at $8.32 at Amazon.com. There were six little ghosts as white as could be. For popcorn and milk and foods that are white. And that would be bad for a ghost on Halloween. They spied in the kitchen some food that looked good. And turned the same color from his feet to his head. And suddenly turned blue from his head to his feet. Ghost number three saw a lemon and took a bite. Before he could spit he was yellow, not white. Ghost number five saw a carrot on the sink. One bite turned him orange as quick as a wink. And soon turned purple form eating his lunch. They looked at themselves. They looked at each other. Or purple, or orange, or yellow, or blue. “Will we stay this way, Mom?” they cried out in fright. They had waited so long for their special day. For eating the things they knew that they shouldn’t. If they could do it again, they certainly wouldn’t. Know of a cure to turn them back again white. He said, “Only white food will make color disappear. And the next year on Halloween they haunted all night. 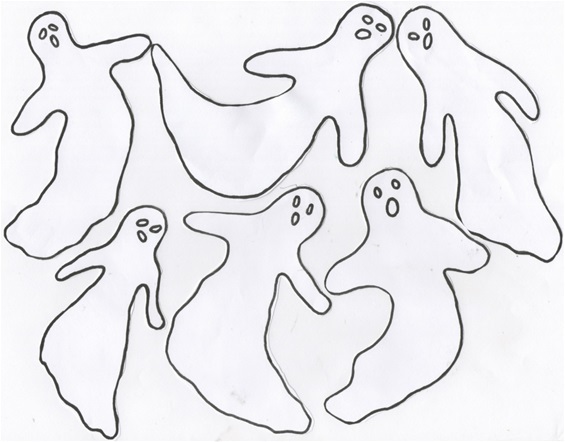 The little ghosts. make two copies of each .. one white and one of a different color. red, green, orange, blue, purple, yellow. 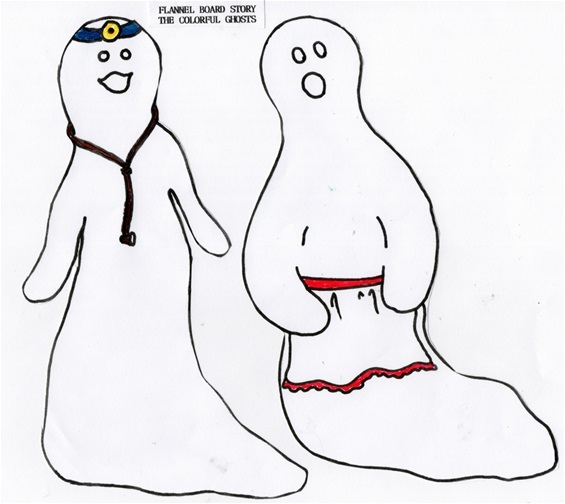 Mother Ghost and Dr. Ghost. 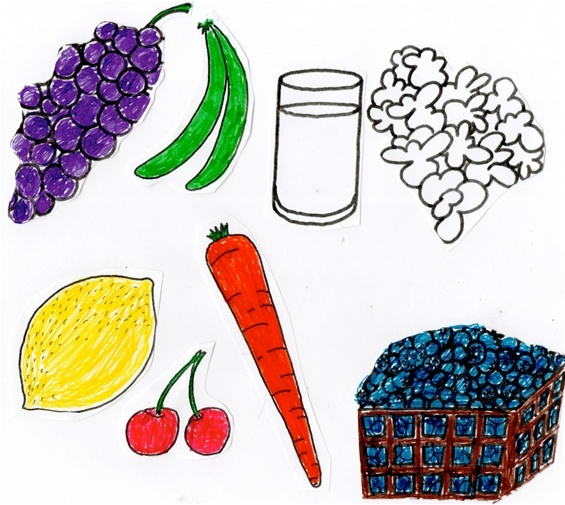 vegies/fruits -- copy and cut out. What is a day in the classroom without circle singing time? 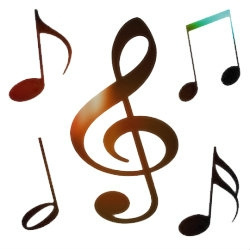 Each month I will include one or two songs for the theme of the month. 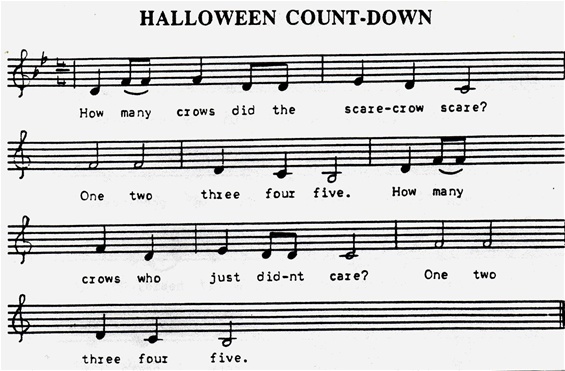 On this song as you sing have students clap their hands to the numbers. On the last line count number of days left on a calendar with the students. (Concepts learned-- rhythm, and numbers, and sense of time.) Here are all the words to the music below. 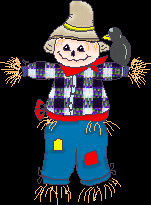 How many crows did the scarecrow scare? How many crows who just didn't care? 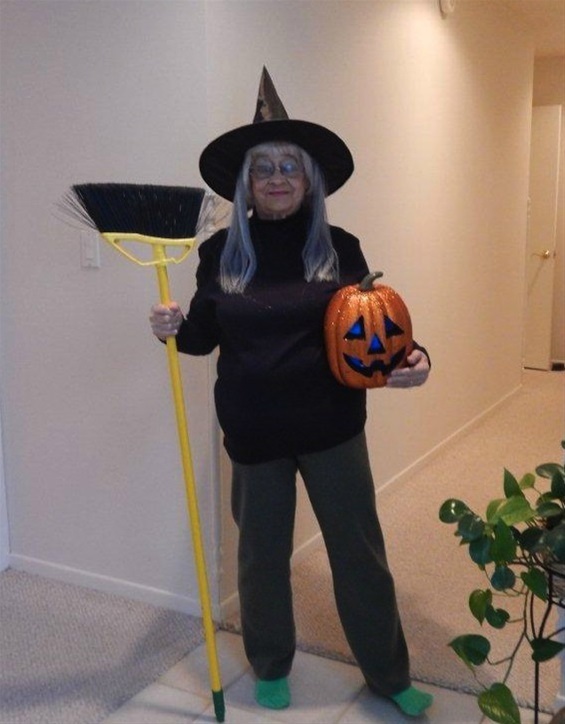 How many brooms did the old witch keep? How many rooms did she have to sweep? How many ghosts have you ever seen? I'm a little witch, flying so high. I can zoom way up in the sky. I'll fly to the moon on Halloween night. Or zoom to the ground and give you a fright! But don't you worry, I'm not mean. I just dress this way on Halloween. So fly me high and fly me low. I'll fly with you wherever you go. All classrooms should have an art center open during free play time with all the equiptment on a table with plain paper and color pictures available. Here is a Halloween color page to leave with other color pages. And what's more fun than joining in with the little costumed creatures on costume-wearing day. Be sure that each and every one of your little students know that it is all make believe. Have fun .. not fear -- on Halloween. Ms Marge is back ! If you use any of our October ideas please let her know. It will encourage her to add to this page. I would like to phone you and catch up on our lives. You are one of my favorite people to have known. I have often thought of you.